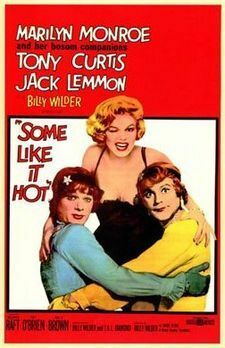 Some Like It Hot is a 1959 American comedy film directed by Billy Wilder and starring Marilyn Monroe, Tony Curtis and Jack Lemmon. The supporting cast includes George Raft, Joe E. Brown, Pat O'Brien and Nehemiah Persoff. The film was adapted by Billy Wilder and I.A.L. Diamond from the story by Robert Thoeren and Michael Logan. Logan had already written the story – but without the gangsters – for a German film, Fanfaren der Liebe (directed by Kurt Hoffmann, 1951), so that Wilder's film is considered by some as a remake. During 1981, after the worldwide success of the French comedy La Cage aux Folles, United Artists re-released Some Like It Hot to theatres. In 2000, the American Film Institute listed Some Like It Hot as the greatest American comedy film of all time.